These terms and conditions embody the whole agreement between the parties relating to the subject matter of these terms and conditions and supersedes any and all oral and written negotiations and communications by or on behalf of them. The parties have not, in entering into these terms and conditions, relied upon any warranty, representation or statement, whether oral or written, made or published by any other party or any person on behalf of any other party or otherwise in connection howsoever with the subject matter of these terms and conditions, except such as are expressly provided herein and subject thereto have relied entirely upon their own enquiries relating to the subject matter of these terms and conditions. The parties agree that to the extent that each of them may exclude any warranties or conditions which might otherwise be implied in connection with these terms and conditions or the subject matter of these terms and conditions by any competent legislation, then each party expressly excludes from application all such implied warranties and conditions. All Supplier Promotions advertised on tasmanav.com.au and or referred to in any and all correspondence are subject to the terms and conditions of the supplier. It is the responsibility of the purchaser to be familiar with and adhere to the terms and conditions as posted on the supplier web sites. Tasmanav.com.au accepts no responsibility for external promotions or competitions. These terms and conditions shall be construed in accordance with the laws of the State of Victoria, and the parties shall submit to the courts of that jurisdiction. tasmanav.com.au reserves the right to make changes to this website and these terms and conditions at any time without any prior notice. Beware, there are many internet sites advertising products at cheap prices supposedly with international or Australian warranties. These products are imported from overseas sources by the company selling on the internet and the Australian distributors (e.g. Sony, Panasonic) will not provide warranty support for these products. These “grey imported” products can also be dangerous to use as they do not comply with Australian standards and specifications relating to our 240 volt power supply and electromagnetic and radiation requirements (www.acma.gov.au). If you see a price advertised on the internet at much less than tasmanav.com.au for a camera, projector etc it will more than likely be a grey imported product. Tasmanav.com.au only sells new genuine products imported by the Australian Distributor or manufacturer complete with a comprehensive Australian warranty. Tasmanav.com.au is the registered trading name of RM & GG Pty Ltd that operates with the registered Australian Company Number (ACN) 149 328 487 and Australian Business Number (ABN) 96 792 159 240. By visiting and using the tasmanav.com.au website, you the (“purchaser”) agree to be bound to and abide by the following terms and conditions. any action or failure to act by any person in accessing, downloading, uploading, using, relying on or dealing in any way with, any materials from the site. Tasmanav.com.au reserves the right to immediately terminate your use of, or access to this site at any time, if tasmanav.com.au decides at its sole discretion that you have breached this agreement or any relevant rule or regulation or you have engaged in conduct that tasmanav.com.au considers to be inappropriate or unacceptable. The price for goods to be supplied is firm and will be supplied as per the special prices quoted by tasmanav.com.au at the time you order. If a manufacturer decreases the price of the goods you have purchased after we have invoiced and dispatched any items, this situation is beyond our control and tasmanav.com.au will not accept any responsibility for this action and will not be required to refund a price decrease if this does occur. If the manufacturer increases the price of the goods you may have on backorder and we request payment for any price increase, you may cancel the order by contacting tasmanav.com.au in writing, which must be received within seven days of us notifying you of the increase. All prices quoted are inclusive of GST and are subject to change at any time at the sole discretion of tasmanav.com.au. In the event that freight & insurance has not been added to the order from you, this will be charged separately and payment will be due as per the terms specified. Tasmanav.com.au reserves the right to restrict the supply of goods to individuals or business, government organisations only and is not obligated to supply in commercial quantities. Ownership of "the goods" delivered by the seller tasmanav.com.au to the purchaser is only transferred to the purchaser or any other interested party acting on behalf of the purchaser when all sums owing to tasmanav.com.au have been paid in full. In the event that goods have been delivered but payment is not made, the purchaser hereby grants tasmanav.com.au the right to enter the purchaser’s premises (or the premises of any associated company or agent where the goods are located) without liability for trespass or any resulting damage and retake possession of the goods and deal with the repossessed goods according to its wishes. In the event of the purchaser claiming possession before ownership, the purchaser is strictly forbidden from transferring, assigning or dealing with the goods in any manner or form. Any conduct to the contrary will result in legal proceedings with tasmanav.com.au seeking punitive damages. Risk of loss or damage to the goods shall pass to the purchaser upon delivery of the goods to the purchaser, or upon collection of the goods from the seller or any bailee or agent of the seller by the purchaser’s agent, carrier or courier. 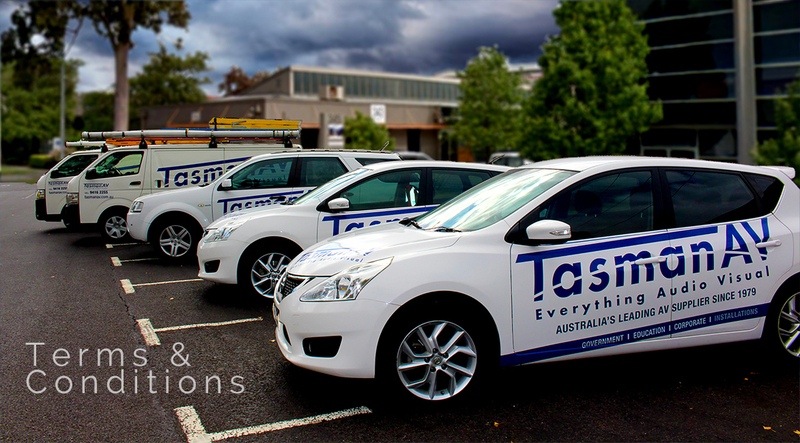 Tasman AV has been in the business of Audio Visual installations since 1979. Understanding our clients's requirements, identifying the right products and integrating the solution is what we do best!